When the politics of the Chinese Australia Free Trade Agreement (ChAFTA) hit fever pitch last week I was in China, teaching MBA students and talking with companies, both Australian and Chinese, about the stock market, the exchange rate and ChAFTA. The jitters in the Shanghai stock market were notable, but it’s mostly small traders with no institutional investors and is not expected to greatly affect China’s real economy. At Bao Steel they bemoaned the price of iron ore, and the wish to capture global supply chains controlled by Brazil and Australia. The hot steel kept rolling through the factory. The steelmakers and other Chinese industrialists did welcome the recent devaluation of the Yuan as helping Chinese industry, but they still aim to transition away from being a “nation of shippers” reliant on exporting to a “nation of shoppers” by boosting consumption. Out west in Xian, Intel Director Fu Hua said the strong growth in the second and third tier cities would counter balance any drop off in Shanghai and Shenzhen. That’s why Intel has R&D facilities in Xian (as does Johnson and Johnson) and manufacturing in Chengdu. In fact, second and third tier cities have created a boom for Australian construction businesses and architects like Hassell (which employs 600 staff in China). 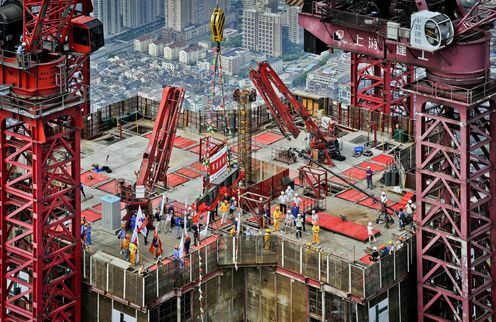 As Beijing directs economic activity westward, demand for infrastructure grows. Australian services providers in building and construction, architects and designers are helping to build “the great mall of China”, and the roads, airports and civic buildings. Overall, on the Australian side, most Australian exporters support ChAFTA. According to the DHL Export Barometer around 58% of exporters think the China FTA will have a positive effect, 41% support the Japan agreement and 38% think the FTA with South Korea will have a positive impact. And this figure in experience generally improves over time if we look at experience with the USA and ASEAN trade pacts. While business representatives I spoke to at AustCham Shanghai see the need for an agreement, there was a view that Trade Minister Andrew Robb had “rushed in a bit” and made some concessions to the Chinese government “that he didn’t need to make”. In fact, the main concerns with ChAFTA concern the labour market. Overall, having an open economy is good for workers. My research at UNSW shows that exporters, on average, pay 60% higher wages than non-exporters, have better occupational health and safety and equal employment opportunity standards, spend more on education and training, and are more productive and profitable as a result. Under an open economy Australia has created more jobs than have been lost, exporters create higher quality jobs and most jobs with exporting companies are unionised. Overall we need this dynamism in the labour market that an open economy brings. As a former ACTU research officer, I obviously cannot be accused of being anti-union or anti-worker. But there are some issues that need to be looked at in detail regarding ownership of land, investor provisions and labour market testing. On some of these issues we need to proceed with caution as state owned enterprises do possess monopoly power and can distort markets in other countries. In case of labour market testing we don’t need it to undermine labour standards. For example, in some limited cases, China may need to use executive and managers like they do on mining and infrastructure projects in Mongolia, Africa and Latin America. But we don’t want trade agreements to adversely affect labour standards and the provision of public goods and labour market testing could be tackled without affecting ChAFTA. And a former Chief Economist of the Australian Trade Commission (Austrade), I obviously cannot be accused of being anti-trade. All in all, ChAFTA will bring important benefits to Australian exporters in China. Having a 48% tariff like an albatross around the neck of some Australian exporters – particularly in the agribusiness sector – is too much of a burden especially when they are competing with the likes of Chile and New Zealand who already have a FTA with China. Remember Australia is not negotiating with China in a vacuum; more than 125 countries have China as their number one trading partner, just as we do. Australia has been one of the world’s most successful open economies – and reliable trading partners of China – in the past 25 years. Opening up to trade has been a positive step for business, workers and consumers, but we need to support our and social institutions – particularly in the labour market. This is after all what has enabled Australia to be such a successful open economy. Tim Harcourt visited China last week as part of the AGSM’s International Business Experience course in the MBA programme that covers Asia and South America.